Florence Fallon’s (Barbara Stanwyck) father dedicated his life to being a minister. After spending twenty years giving his all to his congregation, he is forced out by his church and it’s too much for him to bear. He dies the morning he was to give his final sermon, leaving Florence heartbroken and furious at the congregation for the way they treated him. When she gets up to deliver what would have been his final sermon, she tells the congregation exactly what she thinks of them. The congregation does not appreciate Florence’s brutal honesty and leaves, but she catches the attention of Hornsby (Sam Hardy), a promoter who wants to turn her into a popular, albeit phony, evangelist. Florence goes along with his plan and makes it big. When John Carson (David Manners), a former aviator who has gone blind, hears one of her sermons over the radio, it changes his life. He goes to see one of her shows and waits to meet her afterwards. After they meet, Florence goes back to John’s apartment and they have a wonderful evening together. When Florence realizes how genuinely touched he was by her sermon, she feels extremely guilty about the shady nature of her business and wants to get out of it. But Hornsby has been harboring secret feelings about her and refuses to let her go. Florence continues to see John and falls madly in love with him, but Hornsby blackmails her into going on a romantic trip to Monte Carlo. As she says goodbye to John, she admits to being a phony, but even that isn’t enough to make him stop loving her. Just before Florence is to go on stage for her last show before her trip, John comes backstage and tries to convince her that he has been miraculously cured. He isn’t very convincing, but the effort inspires Florence to go out and tell her followers the truth. Hornsby tries to stop her by turning off the lights, which accidentally causes a fire to break out. Every0ne escapes and John rescues Florence. After that incident, Florence leaves everything behind to join the Salvation Army. One day, she gets a telegram from John letting her know that he may be able to get his vision back and still wants to marry her. I’ve seen most of the movies Barbara Stanwyck made in the first few years of her career and The Miracle Woman ranks as one of my favorites from that era. Any movie that opens with Barbara Stanwyck telling off a whole crowd of people is my kind of movie. Her performance is wonderful throughout the movie, but the way she mixes vulnerability, sadness, and anger in that first scene is incredible and a powerful way to start the movie off. It’s one of my favorite scenes Stanwyck has ever done. Another thing I adored about The Miracle Woman was Frank Capra’s direction. When John comes to see Florence’s show for the first time, she delivers her sermon standing in a cage with lions. 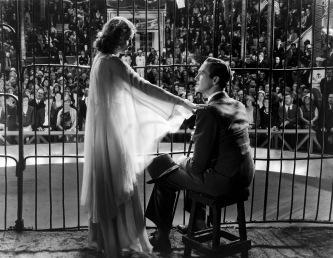 (Yes, The Miracle Woman opens with Stanwyck telling people off, then later she does a scene in a cage with lions. How awesome is that?) The way Capra filmed this scene really stayed with me after the movie was over. Florence wears a robe that isn’t particularly ornate, but it does have a sheer overlay with long sleeves. As she moves her arms, the light hits those sheer sleeves and it makes her look almost angelic, like there’s an aura surrounding her. Given the way Florence’s followers view her, I thought that making her look as heavenly — literally– as possible was a such a perfect choice for that scene.